What is waste? According to the Oxford dictionary, waste is anything that has been discarded as no longer useful or required. True! But wait a minute. Let us relook at the definition—“discarded as no longer useful” would mean that the resource has lost its value to you, not to the person next to you. After all, everything in this universe is made up of the basic 109 elements of the periodic table, or the five elements referred in the Hindu scriptures. But what makes it useful or waste is the way mankind blends these essential elements together. Thus, whatever you are calling waste today has some or the other of those elements which, if recovered, would no longer be called waste. Like many other inventions of the mankind—“waste” is also one of them, perhaps one of the most stupid ones because there is nothing that is waste. The human race doesn’t consume everything that it produces. 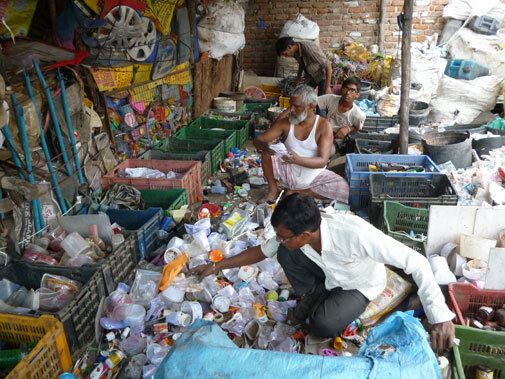 Most of it finds a place in the dumping sites instead of being reduced, re-used, recycled or recovered. The Indian society is quite foolish in this sense. We waste even things that can be very easily returned to nature. The most common example would be organic waste. It is waste only because – who bothers to make compost out of it? The attitude prevails – just leave it aside, or better dump it on the waste-hills of your city and call it waste for another 30-40 years until you make a fancy rock garden over it. But the poor resource shall always be called a waste! "If you judge a fish by its ability to climb a tree, it shall live its whole life assuming that it is a waste," said Albert Einstein. The way we are using our resources and then discarding them as waste and mining for more resources doesn’t lead us anywhere! Anyway, we are not going to leave any resource for the next generations to mine. But yes, as responsible ancestors, we are going to leave them treasures that we today call waste-hills and future mining companies would be seen mining these resource-hills for finished products! But one would ask – why is it a resource and not waste? Consider a pair of shoe. You use the shoe for about a year or two and either throw it in the bin or, if you are a little generous, you would repair it and give it to your watchman or the driver. But irrespective of your generosity – you would find it worn by someone else around. Never seen that! Start being more observant please. Finally, when your watchman, too, throws it, the rag-picker who would pick it and take it to his station (usually a shanty place near a city-drain) where he would segregate it. He will pull the polyurethane sole out of it (remember when you were buying it and the showroom guy told you that your shoe has a PU sole, comfortable and light weight? ), which would be sent to an informal PU recycling unit and finally turned into a slipper which would follow the same recycling until the end of times perhaps. Then come the laces, which would be sent to a shoddy yarn unit. If you discard a shoe in Delhi, you can find its laces in Panipat, which has the largest number of shoddy yarn units in the world. Shoddy yarn units convert rags into riches; or to be more precise rags into threads which are then turned into almost anything you may want, ranging from blankets to bed-sheets, to foot mats to even clothes. The metal clasps on your shoes would go to a metal recycler in Mayapuri and the leather on the top would go to the tannery for re-use in some other bag or wallet or a belt. So what is left of your shoes now? Nothing! So the question is – was it really waste like you thought of it to be? The same happens to your toothbrush, to your pens, to wire, to almost all that you call waste. So, waste is but an imaginary concept and nothing but the creation of the same race that we all belong to. To be true, nature has no concept of waste; it uses everything in some form or the other. And to your surprise, whatever I am blabbering here has already been documented very nicely in Sanskrit, our Vedic language. It means: there is no letter of the alphabet of the language that is not used in a mantra, no root or plant that has not got medicinal properties, no person who is totally useless, but what is scarce is, of course, the right management, that could put these to proper use. Thus, what is lacking in today’s scenario, too, is efficient management of the so-called waste. In any case, the person or the body I am is also an amalgamation of the elements in this universe which took a particular shape on the day of my birth and I came to be known as a human being. I will also be waste once I die, but the elements go back to Mother Nature then. Thus, in a way, I too am a resource for Mother Nature and shall remain in this universe for another millions of years to come, but only in some other form. May be just dust, or ash, or some rich manure under the roots of a shady tree! It’s very same with anything that we call “waste” today. It only loses its value temporarily or just changes form and we start calling it “waste”! But I think, we really need to edit our dictionaries and before we pick up the broom to clean our cities, we need to clean our minds. Satwik Mudgal works as Senior Research Associate in the Industry and Environment unit of Delhi non-profit Centre for Science and Environment. Great Article! I like idea of sensitizing issue by replacing word 'waste' with 'resource'. Great intent! Nice piece putting waste in context, Satwik. Amazing idea about waste!Nice piece of information and an excellent example of shoe to explain management of resource so called waste. 1. Rural areas don't have any kind of organized waste management. Can't SWM with major focus on recycling and 'Minimum Landfill' concept be included in MGNREGA works? 2. In cities, each ward could employ 'beggars' in the recycling industry. 3. The MSWM 2000 rules should put the onus of segregation on citizens. Thank you all for such a warm reception to my blog. Thank you for your detailed response. Yes, Rural areas today are struggling equally on the front of Solid Waste Management, but the notion prevails that our villages are cleaner and way better. In fact, they are consuming similar products as we do in cities, thus they are also producing similar waste streams, but the waste-management infrastructure there is even poorer while the waste-characteristics differ. And Yes, the Rules, should ideally include every local body, be it rural or urban. Thus, including panchayats and in a way, at least, mandating proper waste management even in rural areas would be better. I had mentioned about this problem in another article. You can refer to that at - http://www.downtoearth.org.in/content/garbage-gets-attention. I read your article on Waste? I havenÃ”Ã‡Ã–t heard of anything like that'. I really liked it. I have a question with respect to this, is the same method of segregation really working in other states and cities within India? I am from Chennai and it is also generating 8,000 + tonnes of garbage on daily basis. I don't really see any kind of segregation method followed as you have mentioned here. So what is really happening here just curious to know? Thank you for an interesting response to my blog. Rag-picking is an age-old business in India and across the cities and villages of the country. And, Chennai, like any other city has an army of rag-pickers too. (Just Google 'Rag-pickers in Chennai' An example is here for you - http://www.thehindu.com/news/cities/chennai/ragpickers-chennais-silent-saviours/article5029801.ece). They make money from similar segregation and re-sale. But why you seem to have never seen any of those segregators is perhaps because you have simply not noticed it. You must have surely seen them around. They are everywhere on the streets with a sack on their back, or you can just visit some community bin, or an area near the landfill and explore it on some weekend and you would come across similar rag-pickers there too. It is quite obvious that Chennai or any other city also has poor people who are forced to earn their livelihood from selling what the civilized society discards as 'waste'.